Astana, with GC favourite Vincenzo Nibali, looked like a well-drilled machine as they crossed the line 10secs ahead of RadioShack to take this year’s first red jersey in a trying team time trial. It seemed as the teams came down the floating glass starting ramp (yes, it was floating and it was glass), they were little prepared for the difficulty of this parcours – many losing riders early on and finishing with only five, as strong tailwinds and the twists and turns took their toll. Wildcard NetApp, first out of the gates, set the best time until Omega Pharma-QuickStep showed why they are world champions in the discipline by shaving 20secs off the time, courtesy of the time-trialling beast Tony Martin. OPQS stayed in the hot seat until late in the stage when that other time-trialling beast, Fabian Cancellara, led his RadioShack-Leopard team over the line 6secs quicker. But it was the well-drilled Astana team, the last out on the course, that earned the first red jersey for Janez Brajkovic by a masterful 10secs. Katusha were the big losers of the day, making a hot mess of the ride, leaving Joaquim Rodriguez 59secs behind Vincenzo Nibali. 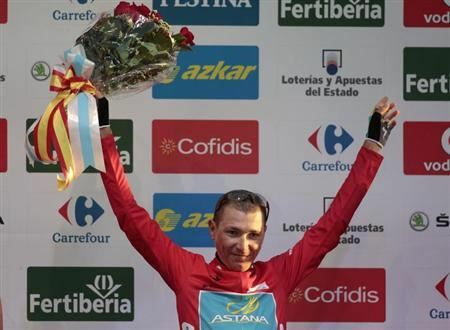 As much as I would love to say Fabs’ boys, the prize has to go to Astana. Did they have to win this TTT? No, they just needed to make sure Nibbles didn’t lose a big chunk of time to his competitors. But they went out like a team on a mission and rode a brilliant race on a testing parcours. They kept calm, they rode fast and they let Janez Brajkovic cross the line first – a nice touch after he crashed out of the Tour de France this year and suffered a ‘complicated’ knee injury. Nibbles, meanwhile, put time into all his rivals: 22 seconds on Henao and Uran from Sky, 29s on Valverde and 59 on Rodriguez.